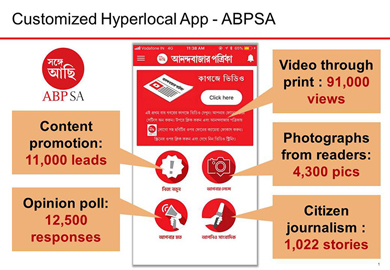 ABP flagship Anandabazar Patrika has launched a hyperlocal 'paper within the paper' to make it more attractive to readers in six districts. Bengali dailies vice president Supriyo Sinha says some readers in outlying parts of West Bengal felt newspapers were too 'metro-oriented', with regional newspapers typically not addressing local problems. Six-page, hyperlocal newspapers for each district have been included within the main newspaper, along with a complementary AR-enabled app. While newspaper sales are typically declining at around three per cent a year, Bengali-language daily Anandabazar Patrika has seen a six per cent upward swing in single-copy sales within four months, Sinha says. Encouraging app engagement has included 91,000 downloads, 12,500 responses through opinion polls and more than 11,000 leads. Sinha says APB layers hyperlocal content with relevant news from nearby regions and national news for a unique blend of content in each region. 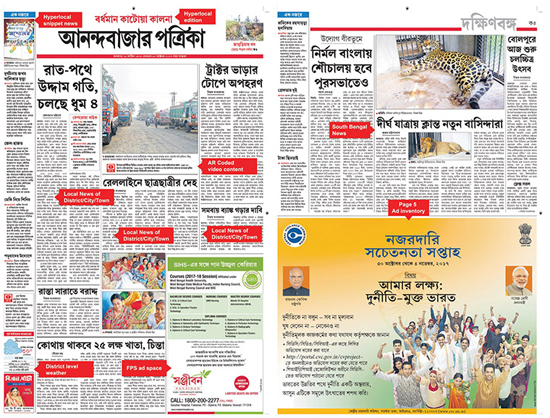 Each district gets an exact but hyperlocal replica of the main newspaper, with its own hyperlocal front, sports, classifieds, post edit, and features pages - Bardhaman-Kalna-Katowa for the East Bardhaman district; Durgapur-Asansol-Ranigunj for West Bardhaman, and so on. On the front page, customised mastheads are supported by the district's biggest story, local snippets and weather, while page two will include local contacts, hyperlocal quizzes, citizen journalism and opinion polls, plus local classifieds. News and snippets on tier-two towns in the district continue on page three, with local features and letters on four. "Each day features a different topic, such as local schools/colleges on Monday, art and culture on Tuesday, business on Wednesday, health on Thursday, agriculture on Friday, kids contributions on Saturday, and travel on Sunday," he says in an INMA post. Page five is allocated for news from adjoining districts, while local sport -including district-level championships and articles on emerging sports talent - are on the back page. The app allows readers to use their smartphone to interact with content by scanning pictures and answering surveys, integrating print and digital. Sinha says videos have been the biggest hit, enabling readers to scan a picture in the newspaper and immediately watch the video. Readers can like or share the video, and leave comments or suggestions. Other engagement features include quizzes and opinion polls, and facilities to submit articles and pictures about local issues. App users also receive upcoming special offers, including local discounts and special content. "People have been taken by sheer surprise by features such as the videos," he says.